Tastefully decorated with antiques, but living in modern comfort. We offer a charming unique ground floor level studio apartment with a private entrance in a beautiful heritage designated home, steps to the ocean and spectacular strolls along Dallas Road. You will find a fully equipped separate kitchen and an ensuite bathroom. The bedroom, with a Queen Size best quality Murphy Bed, doubles as a sitting/living room. Included are Cable TV, access to Wi-Fi, and ample Parking. A three minute walk will take you to all amenities. Victoria inner Harbour is within easy walking distance for more restaurants and entertainment. We are active professional classical violinists, who have located to Victoria to enjoy the west coast, after having had busy full performance careers with the Montreal Symphony Orchestra. This home is located just steps to one of the most enjoyable strolls along the ocean, with the view of the majestic Olympic Mountains of Washington State as a backdrop. Being located in James Bay, it is accessible to all amenities, either by walking, biking, or by car. The "Loth Lorien Studio" is attractively decorated including antiques, and has all modern amenities for a comfortable stay in one of Victoria's beautiful Heritage Homes, originally built in 1893. It was love at first sight when we saw this house, curiously named "Loth Lorien" on the address plaque. Built before the turn of the 20th century, this example of late Victorian Queen Anne style, stands tall and quiet near the ocean, a location that was just perfect for us when we moved here three years ago. Now it's our home, and we are happy to share it with people who appreciate this heritage character, yet can enjoy modern convenience indoors. The picturesque downtown and Legislature Buildings are just up the street, surrounding the bustling Inner Harbour, a ten minute stroll away. We are located here for the Ocean views, the scent of salt water, and ever changing vistas over the Salish Sea. James Bay Village shopping area is a three minute stroll. You have all the necessary shopping, bars, and excellent restaurants for your convenience. Beaches are numerous within a minute of two of the house. 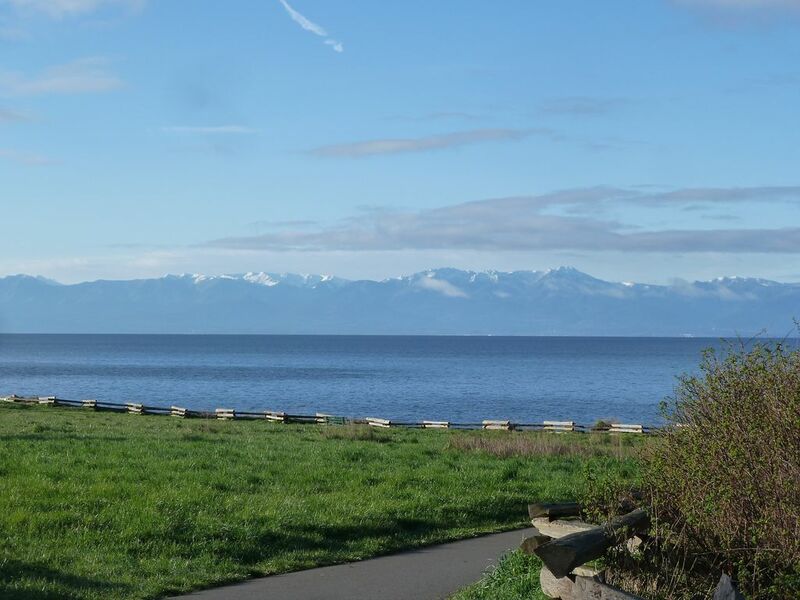 A spectacular view of the Olympic Mountains in Washington State are across the Strait of Juan de Fuca just out the front door. Stroll the minute walk to the sea shore with your morning coffee to take in the ocean view. Our home is just steps to one of the most beautiful oceanfront strolls to be found along the shore of Victoria. At the corner, just steps away, turn right to walk the Ogden Point Breakwater, taking you out to the entrance of Victoria Harbour. Or turn left and walk the stunning shore over the Salish Sea. Quiet and well appointed. Beautiful old circa 1890's home just 1 block from the sea and and easy walk to shopping and restaurants. Suite maintained a lot of the old heritage design with tasteful decor. Off street parking right outside our door. Recommended to anyone who wants a suite with heritage appeal and close to central Victoria. Thanks to Tom and Eva for being gracious hosts. The unit is small but compact and comfortable. The neighborhood is part of the historic area of Victoria with many beautiful heritage houses, one of which this unit is in. The proximity to the waterfront is a plus. Tom and Eva are lovely people and were so kind and helpful. We very much enjoyed our stay. Great location! Fantastic hosts! Loved being there. Clean and very well organized. Excellent James Bay location close to everything. This is the second time I have stayed in this studio apartment and I am very grateful for it. Tom and Eva are kind, caring hosts and most welcoming. The place is quiet and convenient to downtown, Ogden Point, Fisherman's Wharf and many other points of interest. The suite is in a lovely heritage house and has everything you need - a comfortable bed, good kitchen, etc. I hope the next time I'm going to Victoria I will be able to book into this suite again as I feel right at home there. It's always a pleasure to have you stay at the Loth Lorien Studio, and we look forward to your next visit to Victoria. We loved this location, so close to the water and so close to downtown. We could get groceries up the road and could see everything we wanted to see just by walking. The folks were very welcoming and the suite was perfect for our needs. Thank you! Great little suite to stay in! Beautiful place, and wonderful hosts!